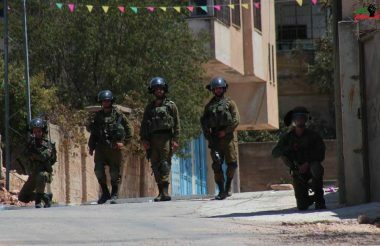 Israeli soldiers attacked, Friday, the weekly nonviolent procession against the Annexation Wall and Colonies, in Kufur Qaddoum village, east of Qalqilia, in the northern part of the occupied West Bank, and injured eight Palestinians, including a child, in addition to a Norwegian peace activist. Morad Eshteiwi, the media coordinator of the Popular Committee in Kufur Qaddoum, said the soldiers fired live rounds, rubber-coated steel bullets, gas bombs and concussion grenades at the protesters. He added that the soldiers injured eight Palestinians, including a child identified as Mo’men Morad, 8, in addition a Norwegian woman. Three of the wounded Palestinians were rushed to a local hospital, while the rest received treatment by local medics. The soldiers also invaded homes, and tried to ambush the protesters from one of the homes the military stormed and occupied. Eshteiwi called on the International Community, in addition to various legal and human rights groups to intervene, and end the escalating Israeli assaults and violations.